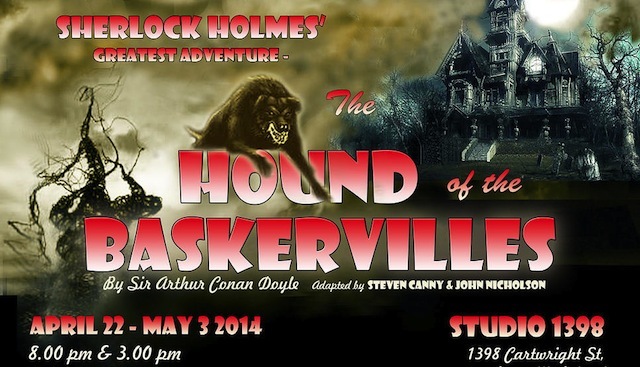 Bad Dog Productions presents its highly successful Western Canadian exclusive production of The Hound of the Baskervilles in Vancouver at Studio 1398 on Granville Island from Tuesday, April 22nd through to Saturday, May 3rd, 2014. Directed by Langley-based, multi award-winning director, Ellie King, this imaginative and hysterical spoof of the classic Sherlock Holmes story is a challenging, yet highly entertaining piece of theatre filled with lightning fast changes of character, scenery, and costume. The Hound of the Baskervilles is one of the most famous detective stories ever told. The noble Baskerville family is threatened by a curse: “a great, black beast larger than any hound that ever mortal eye has rested upon” terrorizes and kills any family member who comes to live at the Baskerville estate. Into this atmosphere of lonely moors, ancient secrets, deadly threats, and ghostly apparitions comes the supremely rational Sherlock Holmes – a man described by his friend Watson as “the most perfect reasoning and observing machine the world has ever seen.” Piece by piece, Holmes and Watson solve the mystery and find the culprit. Tickets for The Hound of the Baskervilles are available online, by phone at 1-800-838-3996, or in person (one hour prior to curtain only) at Studio 1398, which is located on Granville Island at 1398 Cartwright Street. I will draw one winner at random from all entries at 12:00pm on Friday, April 11th, 2014. Follow the production on Facebook and Twitter for more information. Update The winner is Annie mike gismondi! I once saw a Wishbone episode (PBS series)where he dressed as Sherlock Holmes in Hound of the Baskervilles. That was a great show which always combined a classic literary tale with dogs in costumes. Have read the Arthur Conan Doyle story and would love to see how it looks on stage! I’ve never seen a play at Granville Island…great contest! This sounds fun. Loved the book! Love every thing to do with Sherlock, but have never seen a stage adaptation. I love sherlock holmes! Have read the book and watch the movies! This would be one great production to go to!!! I LOVED this particular Sherlock story. I would love to win tickets! My favorite story of the Sherlock Holmes books! Sherlock and Watson are the best, would love to see this take on it. We really enjoy seeing shows at Granville Island! Sherlock Holmes has always been a mystery to me. I’ve never seen Sherlock Holmes performed live – would love the opportunity. Great Job, again Miss.604 – you keep us informed and up to date!